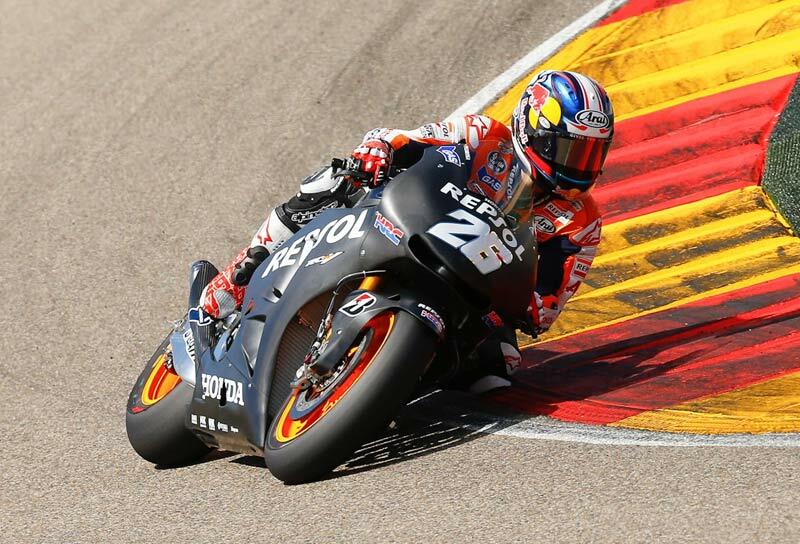 Dani Pedrosa is action on the Honda 2014 RC213V in Aragon today. Jorge Lorenzo was once again the fastest rider as the factory Yamaha and Suzuki riders joined the HRC riders in Motorland Aragon. Lorenzo left it late in the day, but when he posted the fastest lap of the day, a 1’48.076, it unofficially broke Casey Stoner’s 2011 record by four tenths of second. “Compared to normal I’ve been stronger today,” explained the world champion. “At this track normally I suffer many problems in setting up the bike and getting the bike to work like in other tracks. This time from the beginning I have been very competitive with a lot of confidence. However, it was Marc Marquez who was the first man to beat Stoner’s time, when he beat it by 0.017s. However all of Marquez’ work was done on his current 2013 bike. Marquez will stay on tomorrow to test his 2014 bike after yesterday’s wash out. Third place was championship leader Dani Pedrosa who did manage to get some new laps on his 2014 machine, however it was his fastest laps of the day were posted on the 2013 machine. Pedrosa will get to add to his nine laps on the new bike, however wasn’t overly impressed with his new bike. Valentino Rossi ended the day in fourth, nine tenths behind his teammate. But the Doctor leaves Aragon much happier than his times may suggest. Rossi now feels like he has found the answer to his braking and corner entry problems. “First of all we modified a bit the setting and also the front fork and now I feel more confident in braking, I can brake deeper and stop the bike in a better way, for me this is the biggest improvement,” said the nine-times world champion. “After this we tried the swing arm like Jorge has it, a little bit more stiff which I like. We tried some other small things; at the end we made a good package that gives me a really good feeling, especially in braking. Both Honda satellite riders were also in action today. Bradl was testing the LCR Honda, and even got a chance to test the 2014 RC213V today, whilst Bautista continued to work on set up with his Nissin brake and Showa suspension. Suzuki were once again testing today, with Randy de Puniet on the new bike. However the positivity from the Barcelona test was dashed today as Aragon seemed a much tougher track for the Japanese brand. At Catalunya, de Puniet was just 0.772s from Lorenzo’s fastest time, but today he was 2.784 adrift. They also suffered braking issues on the XRH-1.